My card today features the bee from the Dragonfly Dreams bundle and also the gorgeous So Detailed Thinlet dies, and Succulent Garden Designer Series Paper. All supplies and measurements for this card are listed at the bottom of this post! I started with a whisper white base, and added a layer of the designer paper. 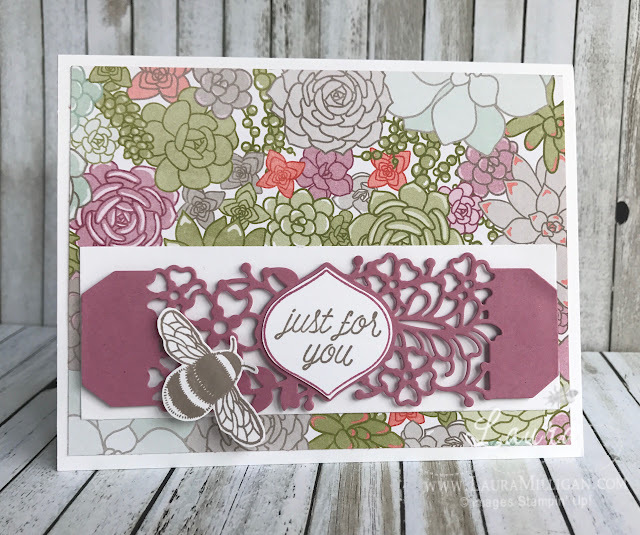 I used Sweet Sugarplum cardstock and the So Detailed thinlets die - using my Big Shot - and the precision plate - it is a must for these detailed thinlets. My word stamp is from the So In Love stamp set - as is the shape I stamped it on. I cut this out by hand - fussy cutting - we are so spoiled by punches, and thinlets that we don't have to cut often - but this shape was an easy one! 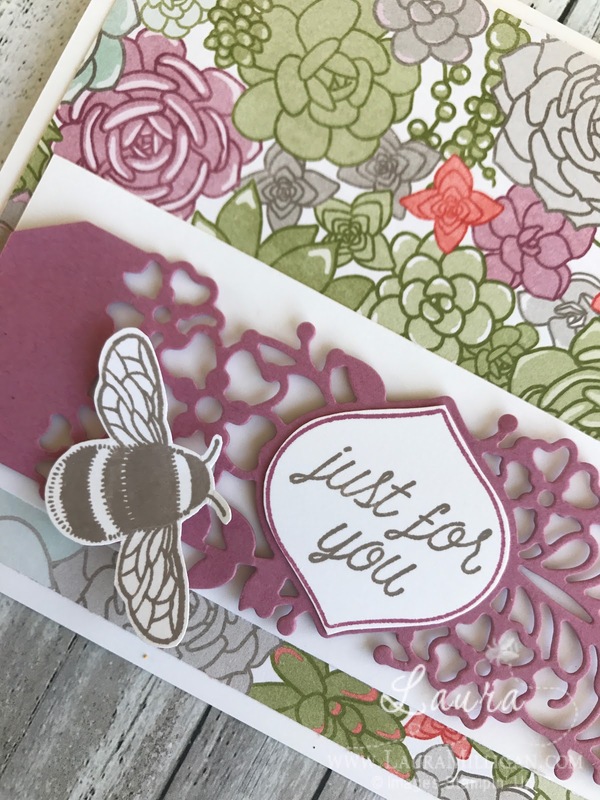 To finish the card, I added a sweet little bee. She was stamped and also fussy cut. Saleabration is coming to an end! Only 11 days left of this year's Saleabration! There are two saleabration items that are no longer avaialble - the glimmer paper stack, and the tin. All remaining Saleabration items are only available while supplies last! If you have your eye on something - don't delay! Sweet Sugarplum 2" x 5 1/2"
Succulent Garden Designer Paper 4" x 5 1/4"
Free Ink Pad Special: My HOST CODE for the month of March is TCGVB42D. Please use this code for any order placed in my online store! FREE INK PAD! As a thanks from me, when you place an online order, and use the host code during the month of March, please select any ink pad that you'd like and I will send it to you for FREE. The ink pad will come separately, and will be sent after I close out the host order. Click here to visit my upcoming events. Hope to see you soon!